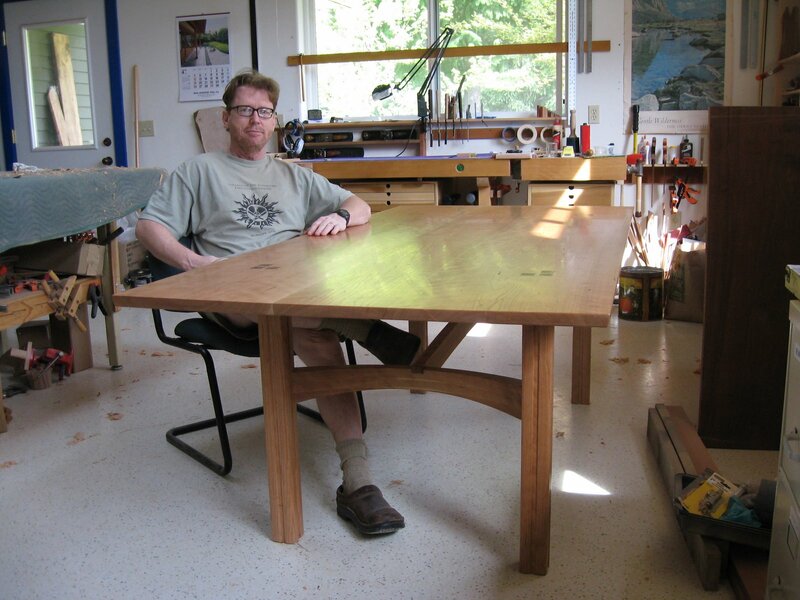 The Mid-Willamette Woodworking Guild Show is up and the dining table made it in, but it was a sprint to the finish–and with the finish, as I was applying oil/varnish only hours before stuffing the table in the van. Dry finish, dry I say! 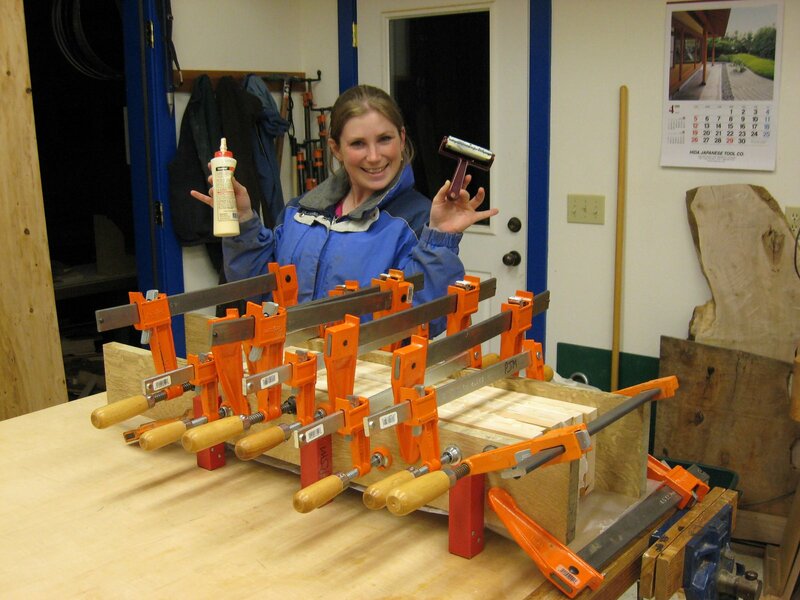 Picking up after the glue up (and the close of Cabaret), next came the inlay process. I was originally planning to inlay rosewood, but a billet of Macassar ebony that has been lurking in the shop for 16 years had some curvy figure that looked promising, so I sliced of a 1/8″ thick piece on the bandsaw and cut it into squares. 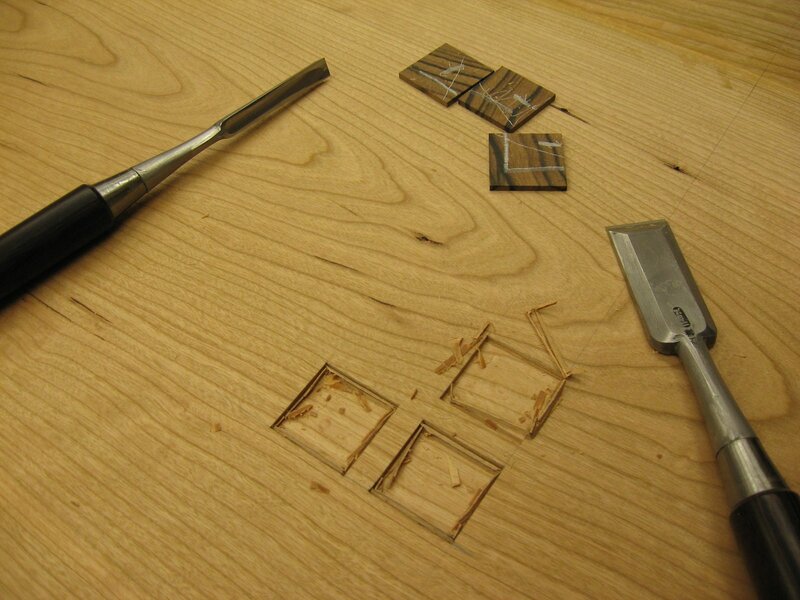 I then laid out lines with a scalpel so the inlays would land right over the table legs, hogged the bulk of the material out freehand with a router (after burning a couple hours on a router template that was not satisfactory), and cut to the lines with chisels. 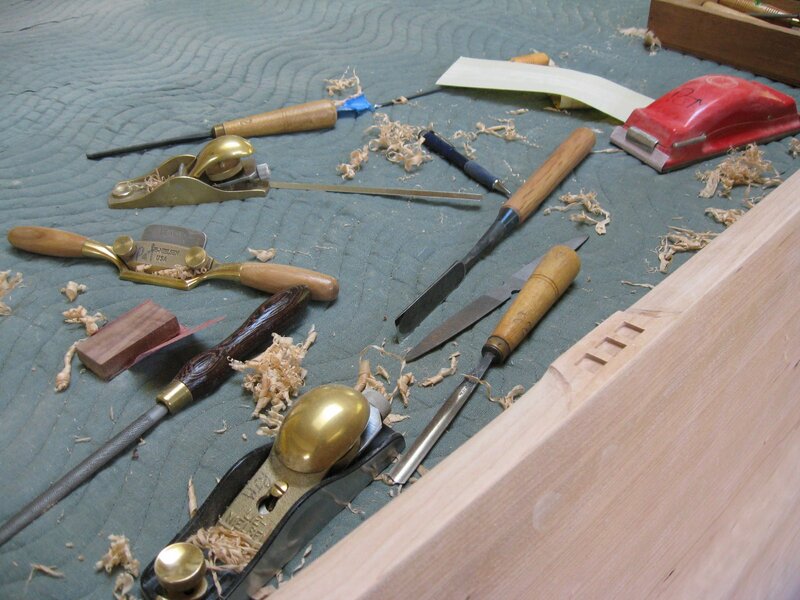 Love those chisels! Then it was time to level and smooth the top, a real extravaganza of fluffy shavings. I had to sharpen frequently to avoid tearing out the reversing grain of the quilted cherry, and it turned out splendid–thankfully, because it was a ton of work. 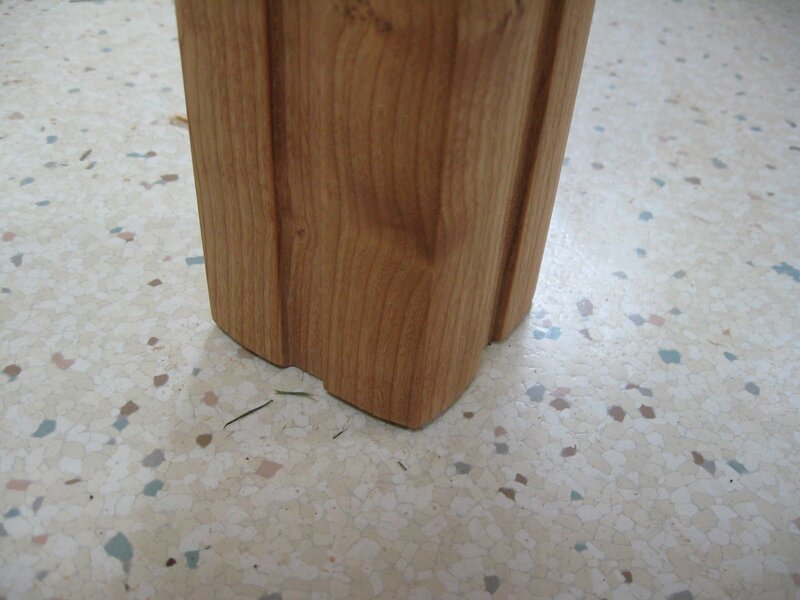 Some of the Macassar inlays planed nicely in the same direction as the cherry and some did not, but there was no way around this if the curves were to flow nicely. Needless to say I lost track of direction and created tearout in some inlays. A card scraper saved the day, to me the most amazing tool in the shop; a seemingly unremarkable flat piece of steel that performs miracles. It deserves its own post some time. My friend and helper David planed part of the underside of the table, and he is now heading down the road to handplane addiction. The shavings are so lovely, and when you take a clean pass over this cherry it looks as if someone turned on a light bulb inside the wood – the figure and color jump out! Hogga Dogga! 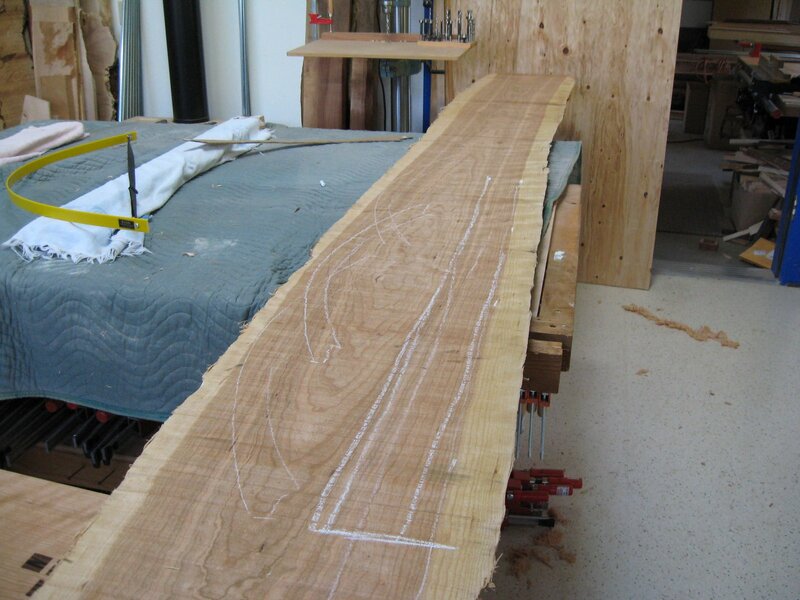 On to the edge profile of the table top, but is a sweetly curving bevel enough? No, or course not. We have Lots of Time, let’s carve a detail into each side as tribute to my teacher Kevin Rodel, Arts and Crafts designer and maker extraordinaire, with whom I studied at the Center for Furniture Craftsmanship some years back. At this point the top was ready to start sloshing finish on, and it was time to construct the base. 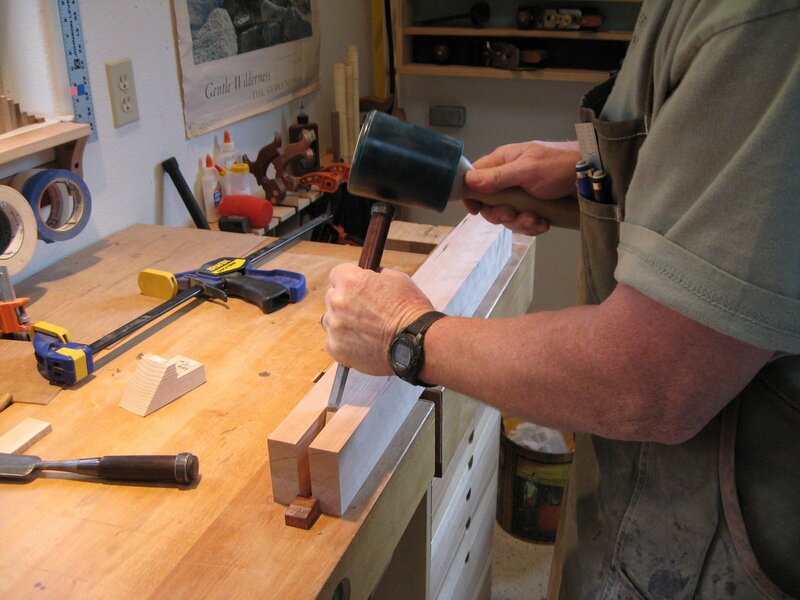 Since everything readily visible was built from four sequential 5/4 planks from a single tree, the first step was milling and gluing up blanks for the legs and other thick parts. Daughter Meghan stayed late that night to keep me on task and lend a hand. Another day she brought me Cirello’s pizza–Love you Meg! but a lot had to be done by hand. More fun with chisels. 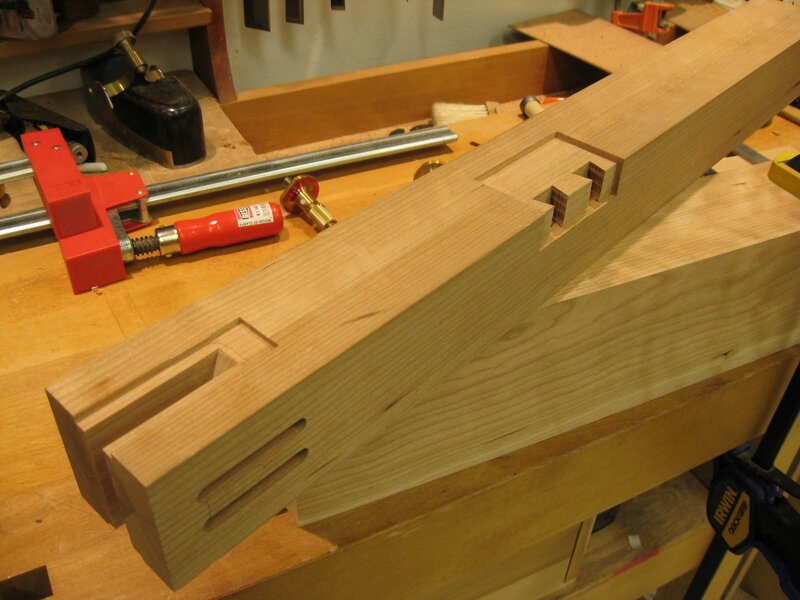 There is a good bit of joinery going on here, and it came out nicely; the mortise and tenons give a satisfying POP when pulled apart, like a champagne cork. 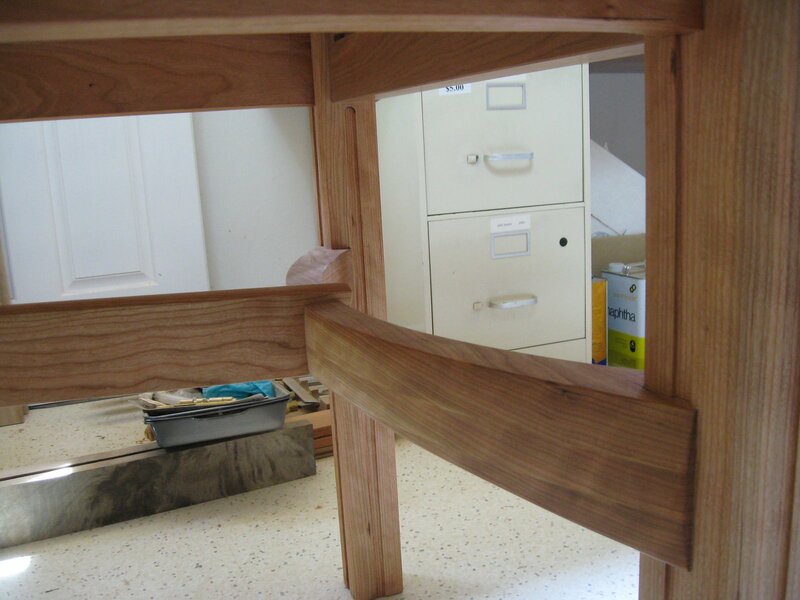 With the joinery complete it was time to refine and detail the shapes. 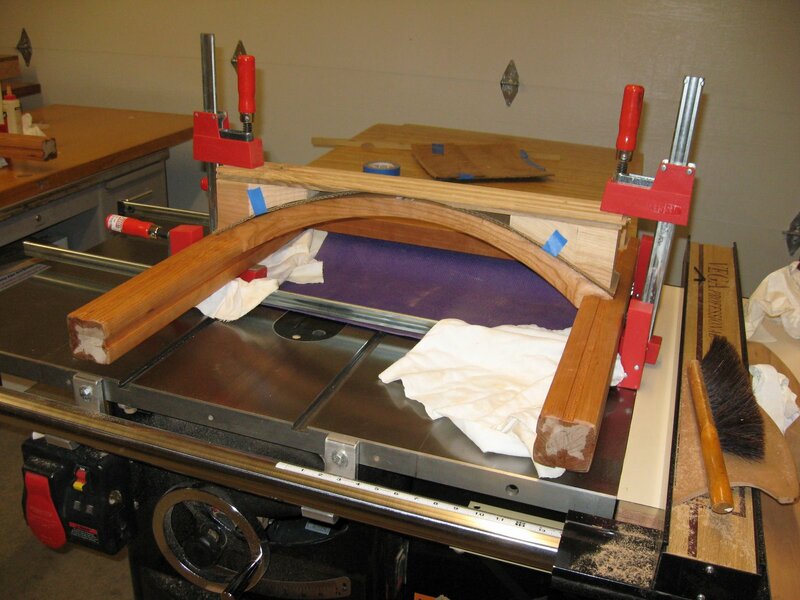 The big curving stretchers were bandsawed, spokeshaved, and finally sanded into soft fair curves. It was a huge workout with time running short and made a humongous mess in the shop, but for me these give the ooh-la-la to the table. Straight stretchers would have been easier, but that wouldn’t have been The Cowboy Way. I shaped the legs with router, tablesaw and handplane into a highly abstracted flower form (that’s how I see it, anyhow). 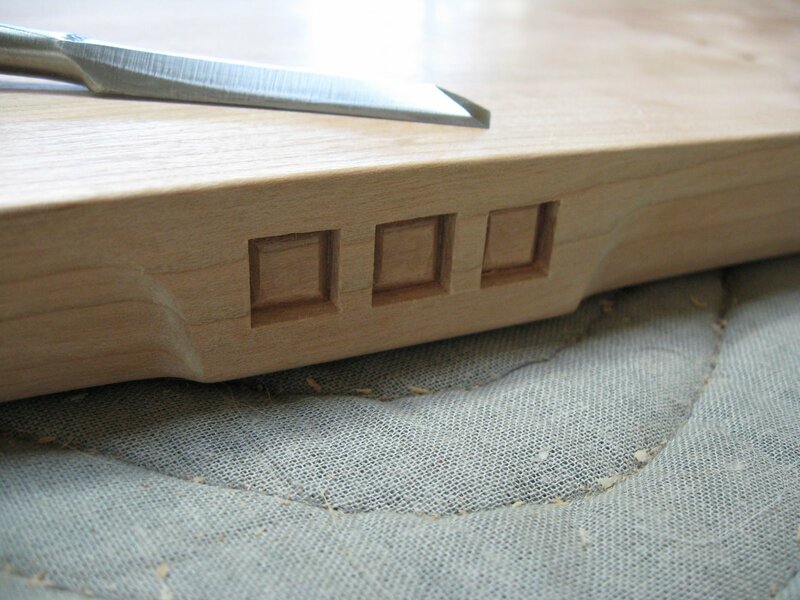 The grooves on each face have nice soft inside edges, not the hard right angles that a typical router bit or saw would make. Yikes, only a couple days until the show, and nothing is glued up yet. I applied a coat of oil/varnish and urged it to dry more quickly by setting it in the sun on an unseasonably warm day…which caused little beads of oil to keep forming on the surface. Nice try. At least by finishing before glue up the few little beads of glue squeeze out were easy to remove and there were no pale splotches where the finish couldn’t penetrate. Here is the end subassembly finally glued and clamped, with fancy cauls that David made to handle the curving stretchers. 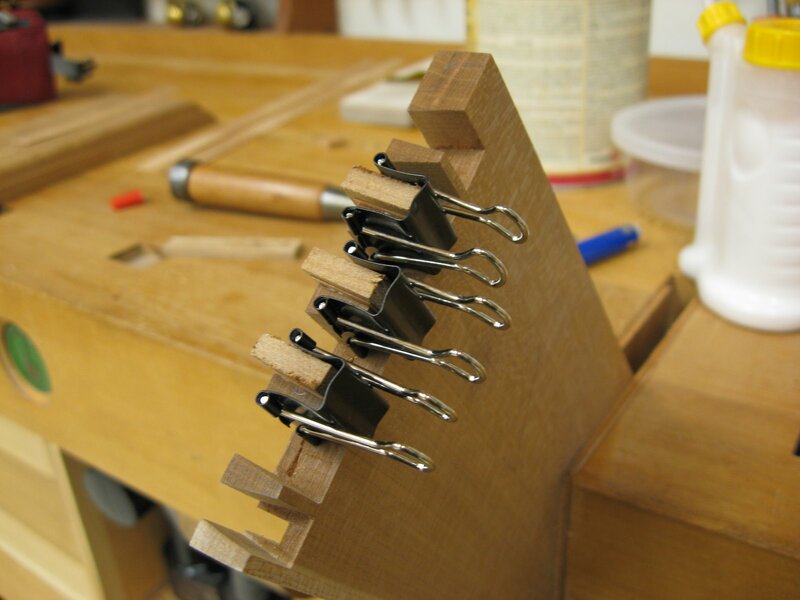 While doing a dry run of the glue up I managed to install one curving stretcher upside down (don’t ask), which slightly compressed the shoulders around the sliding dovetails. So next morning (30 hours and counting) I had to “dust” the joints, and it is euphemistically called by some; putting something sticky into the hairline gap (I tried oil/varnish, it worked OK) and then working in some sawdust. Tick tock, another 90 minutes, but at least the joints look as good as before I dry-fitted that piece wrong. Almost. Well, not really, but better than undusted. Arghhh. Most people would have needed a microscope to see the gap even without dusting, but this is one of the curses (or blessings) of my severe near-sightedness – take off my glasses and I can see really fine details. On through the day and into the night refining detail after detail. Morning, 8 hours until delivery. Dry assembled everything and it is solid as a rock without glue–decided not to glue long stretchers in place in case I want to refine more details after the show, which will be easier if the end assemblies can be handled separately. Made cleats of hard maple to attach the top to the base. Flipped the top upside down, positioned the base, making sure it lined up with those inlays! Then a scary step – drilled into the underside of the top to attach the cleats. Drill too far, and there will be a nice hole in the table top, just about big enough for a single stemmed rose. From my funeral bower. Bad idea, must not drill too far! It’s a table. And I’m exhausted. old chum, come to the Cabaret. And boy did I–we just closed a run of this wonderful dark musical last night, and struck the set today. 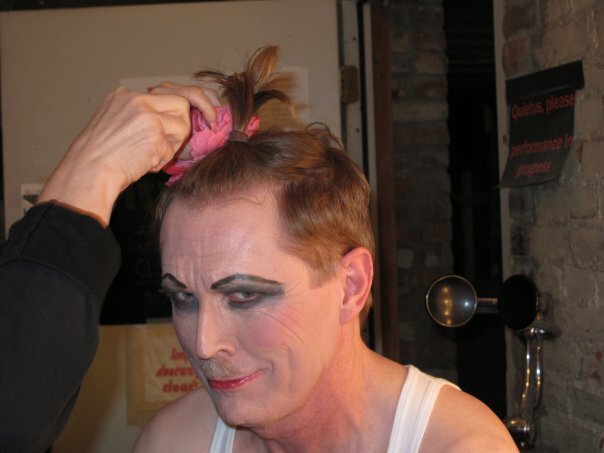 Closing night I collaborated with Margie the makeup queen to give director Leah Burgy some shock therapy. Looking in the mirror certainly gave me a shock! The end is a bittersweet time; friendships often bloom during community theater shows, but this was a particularly wonderful cast, talented and warm and funny, and I’ll miss working with them; on the other hand, we get our evenings back and don’t wreck our skin applying and removing pounds of makeup each day. Ah well, big hugs to everyone, and (in her own words) a sloppy wet kiss to our fabulous Director Leah Burgy for bringing us together to sing this story. Finishing a project can likewise be bittersweet, but there’s no time to ponder that just now – only a week and a half to finish the dining table for the Guild Show – yikes! and a bottle of glue! There is a certain piratical combination of planning, savvy, recklessness, and brute force needed for a major glue up, and the Jolly Roger was flying in the shop today as the dining table top went together. Days of work were on the line in a seven minute sortie, a choreographed mayhem of glue and wood and clamps and big mallets (just in case). Afterwards a bottle of rum doesn’t sound like a bad idea at all. at 30 gallons apiece, plus the beautiful wisps on the floor from hand planing, and the pile that spilled when I waited too long to empty the dust collector. That’s a lot of shavings, especially considering that they came from just three planks of fine Pennsylvania black cherry–how can there be anything left? Three days ago they were sequential flitches – stout planks the full width of the tree, like slices of a carrot going the long way. A day of looking, hoisting, flipping, composing, squinting to see growth rings, grain graphics, curl orientation. 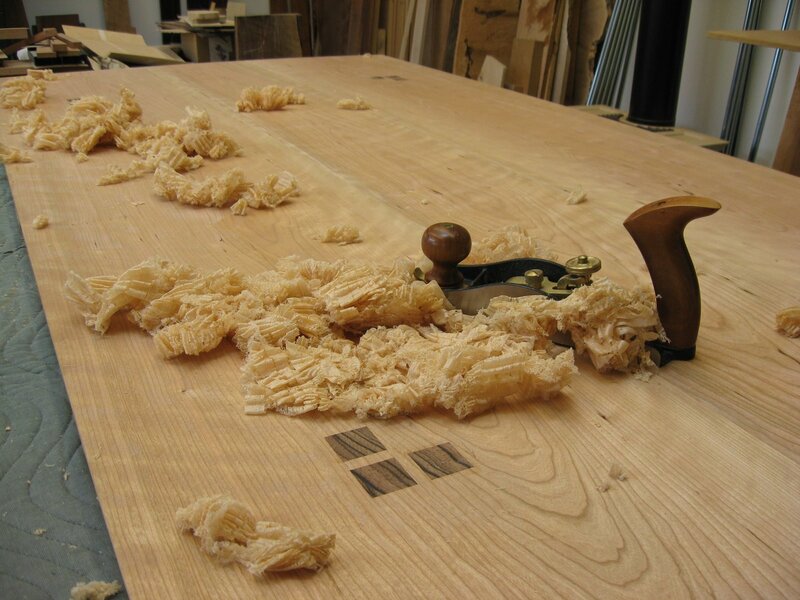 Another two days of milling: commitment anxiety before the first cut on the bandsaw, brute strength pushing a 16″ wide cut over the jointer, wondering whether THIS planer pass will finally remove the last sawmill marks (please…), the whisper of a freshly sharpened plane on the edge joints. The shavings have gone out to the yard for mulch, lots and lots of mulch–surely there can’t be much left of those 3 big flitches. But there they are: a 7′ long dining table top with a gentle herringbone-patterned curl, ready for glue up. Much has been taken away, but much has also been put in. Ah, the possibilities of blogging. And the pitfalls. I will be most grateful for your patience as I climb this learning curve – thanks!